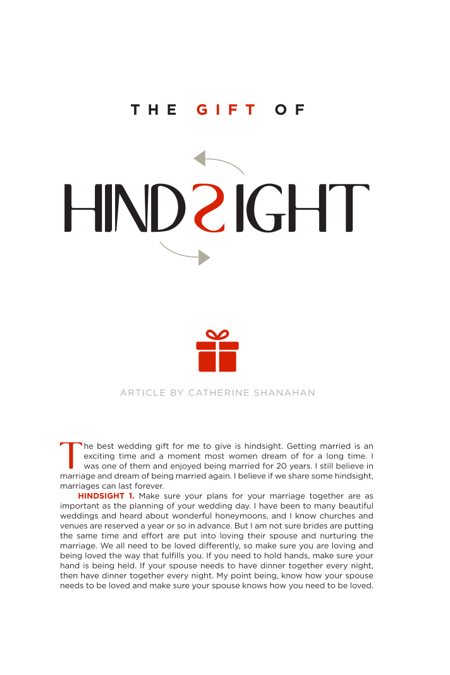 The best wedding gift for me to give is hindsight. Getting married is an exciting time and a moment most women dream of for a long time. I was one of them and enjoyed being married for 20 years. I still believe in marriage and dream of being married again. I believe if we share some hindsight, marriages can last forever. Hindsight 1. Make sure your plans for your marriage together are as important as the planning of your wedding day. I have been to many beautiful weddings and heard about wonderful honeymoons, and I know churches and venues are reserved a year or so in advance. But I am not sure brides are putting the same time and effort are put into loving their spouse and nurturing the marriage. We all need to be loved differently, so make sure you are loving and being loved the way that fulfills you. If you need to hold hands, make sure your hand is being held. If your spouse needs to have dinner together every night, then have dinner together every night. My point being, know how your spouse needs to be loved and make sure your spouse knows how you need to be loved. Hindsight 2. If you are both professionals, make sure you retain your professional identity, whether you choose to keep working or not. I have met with many divorcing women who have given up their careers to raise their children. There is nothing wrong with that, and quite frankly raising children is the most difficult thing to do (in my opinion). But keep up to date with your profession; it’s empowering! How nice it will be at times for you to discuss things other than the kids. If you do not have a career, it is still important to stay current and involved with something other than household duties. Trust me, your spouse will respect you, and you will feel proud. Hindsight 3. Discuss your financial goals and expectations. Usually one person is a spender and the other is a saver. No problem if you have goals and expectations together. The easiest way to do this: make a budget. I would do this before you even get married. Yes, it will change, but at least you air out your expectations and avoid conflict in the future. You can find budgets online, contact me or someone like me and we can send you one. Conflict with finances often begins with money and is a topic many never discuss until one spouse is frustrated over it. Many situations arise, so be proactive and start with your agreed upon budget. Hindsight 4. Don’t comingle inheritance money. I have a client who lost her mother in the 911 attacks. After 20 years of marriage, she got divorced, and because she comingled her inheritance, she had to split it with her ex-husband. If she hadn’t comingled her inheritance, she would have the whole amount, which represented a portion of her mother’s legacy. The rule: as long as inheritance monies are not comingled, they are not considered marital assets. Hindsight 5. All too often, I meet women who never get involved with financial assets. They don’t pay the bills, ask about retirement, look at credit card statements, inquire about investments or bank accounts and only use their credit card because their spouse pays it and handles everything else. Please do not do this! It is fine if your spouse handles it all, but be informed. Look at the statements, meet with your financial advisor, ask questions, know your credit score and ask more questions. If your questions go unanswered ask again. Hindsight 6. Do not sign your tax return without being present with your tax advisor. You should be as involved as your spouse is. This is especially important if your spouse owns his own company. Being present shows that you are interested in your financial well-being together. Financial concerns are one of the biggest reasons for divorce, so don’t ever take yourself out of the care of your family’s financial matters. Ask questions if you need to, and don’t be ashamed if you have to ask questions multiple times. Remember, CPA’s and financial advisors work for both of you. Life throws us many obstacles, and marriage contains some of them. Having a healthy marriage requires a lot of work, but is worth it. Communication is key! Although you may not be comfortable with financial matters, be informed. Your spouse will find your knowledge attractive, just as you will find him helping you with the kids and house attractive. Just don’t forget to ask for his help. As a CDFA and founder of CSM Divorce Financial Solutions, Catherine Shanahan helps individuals assess their current financials to made the appropriate choices for their divorce agreement. She does business in SC, NJ and PA.